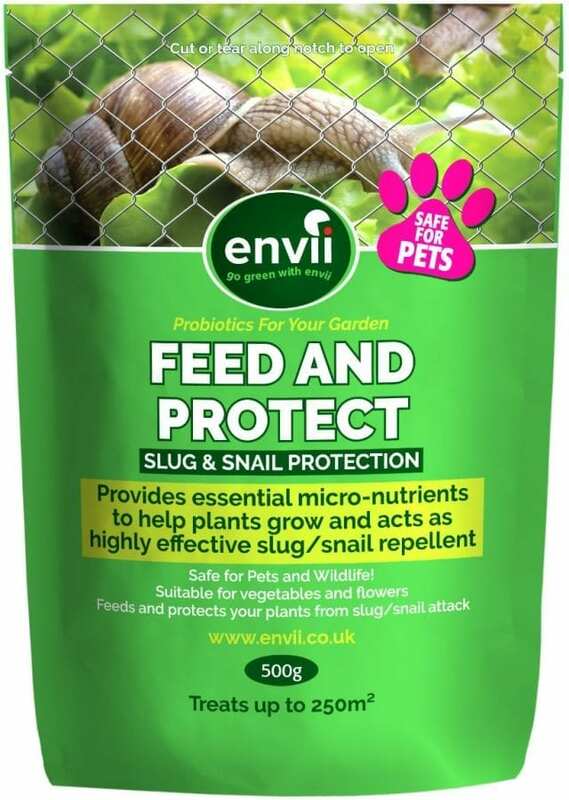 Pet Friendly Alternative to Slug Pellets! Common slug repellents are usually dangerous to everyone and everything that comes near them. From poisonous slug pellets that can harm children to beer traps that can leave your pet with a slightly sore head the next morning! Whilst we want to protect our beloved plants, we obviously don’t want to do it to the detriment of life. 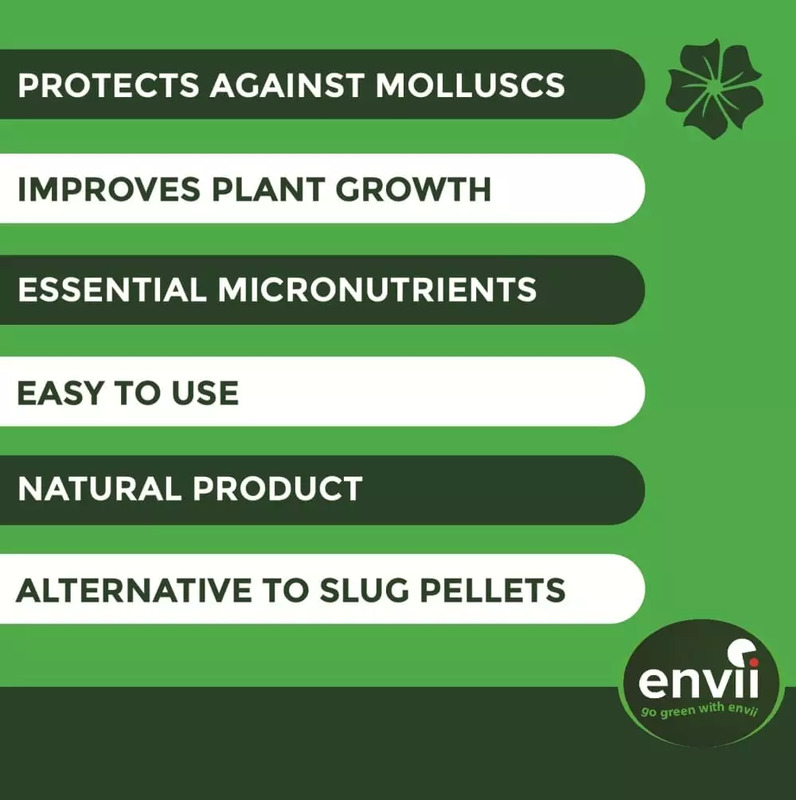 What if we told you that we have an alternative to slug pellets that can protect your plants, protect the environment and protect the lives of pets, children and wildlife all at the same time? Surprise, surprise! Feed & Protect is a dual-purpose alternative to slug pellets that does exactly what it says on the packet! Using a concentrated blend of micro-nutrients, Feed & Protect feeds plants to improve growth and nutrient uptake whilst protecting them. However, the really unique thing about this product is how it protects your plant from slugs. Rather than using a pellet, powder or gel, Feed & Protect slightly alters the taste of the leaves making them distasteful to slugs. As a result, the slugs are not interested in eating them and move elsewhere. If you don’t like your neighbour, you could hope that they go and take an interest to their plants! The alteration in taste is so slight that it cannot be detected by humans. We already have a strong palate that is used to coffee and curry so can’t spot the difference. Fortunately, slugs have a very simple diet of foliage and, well foliage. Because of this, they have a very simple palate and any slight adjustment in flavour discourages them. It’s a win win for all! Your plants are protected, benefit from essential micro-nutrients, children and pets are safe and there will be no slugs harmed in the process. 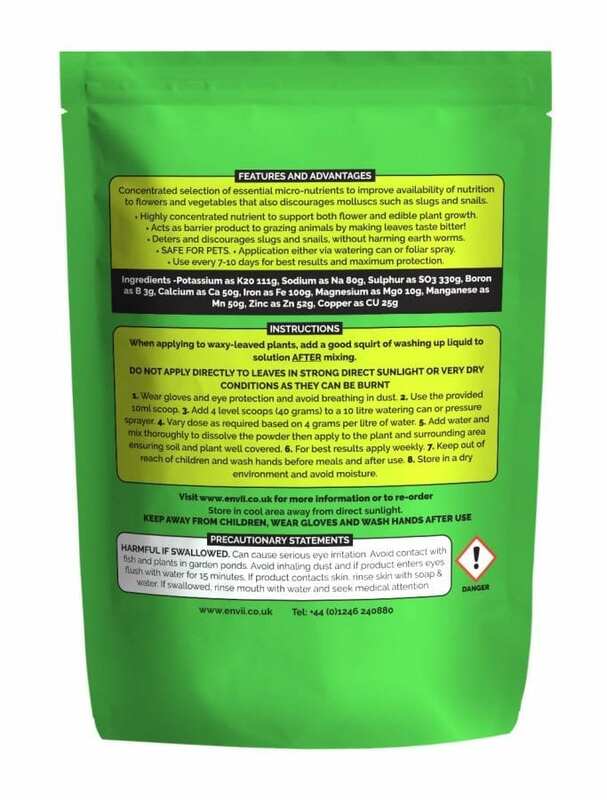 Don’t apply Feed & Protect to leaves in direct sunlight or very dry conditions as it can cause temporary discoloration. Have a read of Terry Walton’s opinion, BBC Radio 2’s Allotment Doctor. If you want to learn more about how Feed & Protect can protect your hostas and improve the growth of your plants, check out these two post from The Blackberry Garden and The Unconventional Gardener. We will warn you though that one of these posts is a couple of years old and does contain some rather old looking packaging that we used to have! We’ll let you decide which post it is. For waxy plants such as hosta’s add a squirt of washing up liquid to the solution before applying to plants. Yes, when used as directed, it poses no danger to pets or children. No, it simply deters them by slightly altering the taste of the plant. Does it only work on vegetables? No, Feed & Protect can be used on all plants, from vegetables to flowers.